What is the Best Sacrifice in the History of Chess? The position before move 22. Qxf4!!!! My answer to “What is the Best Sacrifice in the History of Chess?” as asked on Quora. Before I explain my choice for the best sacrifice in the history of chess, I need to elaborate on the difference between: 1) what is the best move? and 2) what is a beautiful sacrifice? I define “beauty” in chess as a move played for the sake of art and not of necessity. Exciting moves should not be confused with beauty as exciting play is often the only correct path hidden by more natural looking moves. 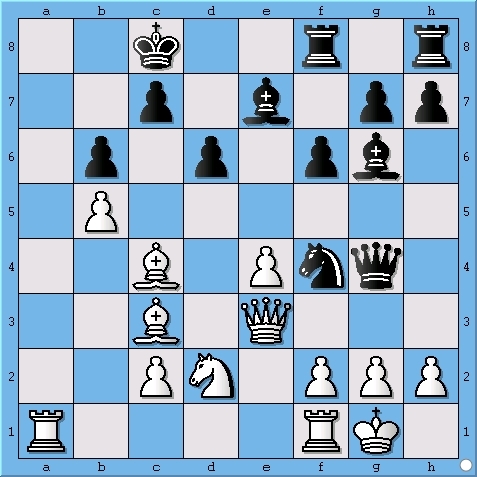 Many refer to such moves as “beautiful” but if a computer had played it the move would just be considered “best.” Therefor, a beautiful sacrifice in chess should be a move which loses material in route to a win for the sake of art and not because the position requires the piece to be sacrificed for victory to be achieved. It is my hope that what is “best” according to a computer will never become the standard for what is “beautiful” to a human.